Carl McLean, blogger, parent, campaigner and contributor at Mom Bible shared that over the past few decades childhood obesity in America has tripled: affecting about 12.7 million children and adolescents. It’s a particularly heated issue in recent news and everyone is looking for ways to help their children avoid obesity and its associated health conditions. “Portion Distortion” is a term which reflects a growing realization that when it comes to children having healthy eating habits, it’s not always the type of foods that are the problem. But how do we know if we are overfeeding our kids and what exactly is a correct portion size? It’s important to us all that our children grow up to be healthy and happy; unfortunately, children who have too high a calorie intake will be taking steps towards having a problem with their weight. This can put a strain on the child’s development and obesity can continue as the child increases in age, leading to unwelcome health problems such as type 2 diabetes, hypertension, and heart disease to name a few. Additionally, it’s also not going to be emotionally easy for a child to grow up with an unhealthy weight; their self-confidence will suffer, potentially they will get bullied and this can lead to a dependence on food in the form of an eating disorder. For a child at a young age to be taught some awareness of their body and how food affects it, nutritional benefits of healthy food and how eating too much is wasteful would be a great benefit for them and will ensure they get a head start in decent eating habits for them to apply as they grow and gain independence. It’s up to the parents to give their children a good understanding of what foods are healthy and nutritional for them and how consuming too much junk food will harm them. The meals that you provide your kids will be their reference point to how they consider food in the future and so being modest with portions will certainly help. Having an encouraging and supportive attitude is key, never force your child to eat more than they want to eat, as forcing them to clear the plate when they are clearly not hungry will only serve to develop a negative relationship between your child and food. Let them ask for more if they have finished and are still hungry remembering its better for them to fill up on healthy options which count as part of the recommended balanced diet. Having healthy eating habits is not just about having balanced meals, however, it also includes when and what you choose to snack on. Encouraging a diet which includes snacking on healthy options such as fruit and vegetables is a challenging aspect of parenting when you know you are up against the temptation of the high calorie, sugar-saturated options of candy, chocolate and pop that line the shelves of every store. Dairy – Food produced from and including animal milk, dairy is a reliable source of calcium for children as well as other minerals. Calcium is used in our bodies to maintain bone health and density. A calcium deficiency can lead to illnesses such as osteoporosis. Fruit – Often a tasty dessert alternative to unhealthy options, an important source of dietary fiber and packed with minerals and vitamins depending on the fruit. Vegetable – The most important but unfortunately the most difficult to get your kids to eat, forget love! Ideally should make up the largest proportion of the diet as they are ever so important for nutrition. Lean meats (and poultry, fish, eggs, tofu, nuts, and seeds) – Main source of protein, is used by the body for cell growth, maintenance, and repair. Grains – Wholegrain should always be the primary choice to avoid grain products with high added sugar and fats. Grains are essential for dietary fiber. Objectively; a balanced meal will consist of 1⁄2 vegetables, 1⁄4 lean meat or beans, and 1⁄4 grains. With that in mind, you can create a meal for a child in which each food type that makes up the meal is measured in cups (1/2 cups, etc) giving them a balanced diet relative to their age and size, such a serving guide can be found here. The USFDA nutrition labels found on food packaging include serving suggestions, but it’s critical to remember that this differs from portion size as it’s referencing a specific serving for a 2000 calorie diet. The portions that you estimate for your child will take into account that children have a lower calorie intake requirement than adults and hence require smaller portions. Also, the portion size you choose to serve your child should be determined by their stage of development. The older a child is (between 1 years old to adolescence) the bigger their portions should be to suit their needs. You may find that they may have fluctuations in their appetite from day to day, and this is completely expected and suggested you use your child’s appetite as a natural guide to their nutritional requirements. 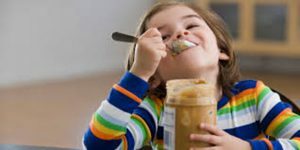 The most sensible advice any parent should take into consideration is that the relationship that their child has towards food is completely dependent on how their parents or caregivers teach them to behave with food. Eating a balanced meal at regular times during the day in healthy amounts is a sure way to expect a healthier life. Even though knowing how nutrition and portion size are related and putting that into practice seems like the be all and end all, in fact, it’s only half the solution. It’s just as important to make healthy eating a fun activity and as a tip, it goes hand in hand with gardening; preparing and cooking with food that you and your children have grown at home is extremely rewarding! Another suggestion to keeping your kids engaged in what they eat is to take them grocery shopping and have them be a part of the shopping trip, involving them in a discussion about what they are going to be eating. You’ll only come to thank yourself for your efforts when your child reaches the point of being able to make these critical decisions for themselves.